There is evidence of phyllosilicate material (clays) throughout this region, named Nili Fossae. The evidence comes from the OMEGA experiment on the European Space Agency’s Mars Express spacecraft and CRISM on the Mars Reconnaissance Orbiter, infrared spectrometers that can identify minerals on the surface of Mars. 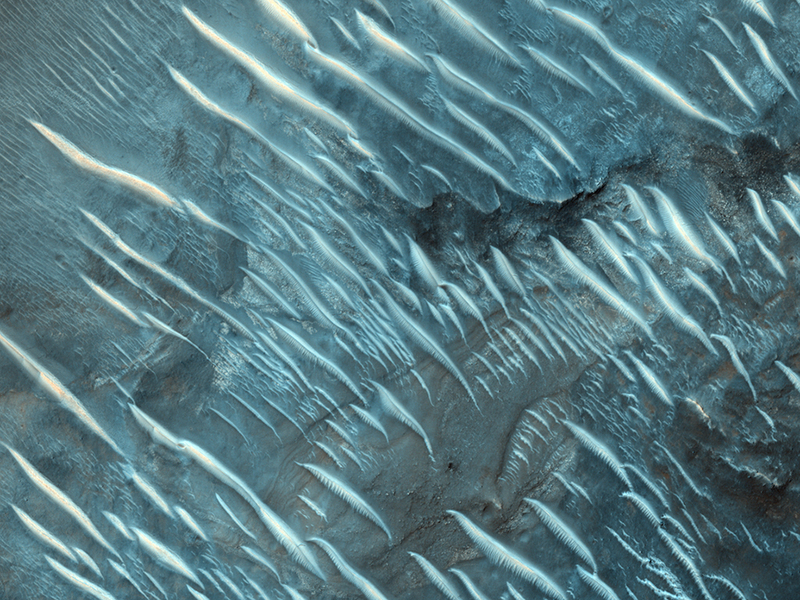 In the Nili Fossae region, the spectrometers have found remarkable diversity in surface composition. Because of the evidence for clays and other interesting geology, Nili Fossae is also being considered as a landing site for the Mars Science Laboratory rover. 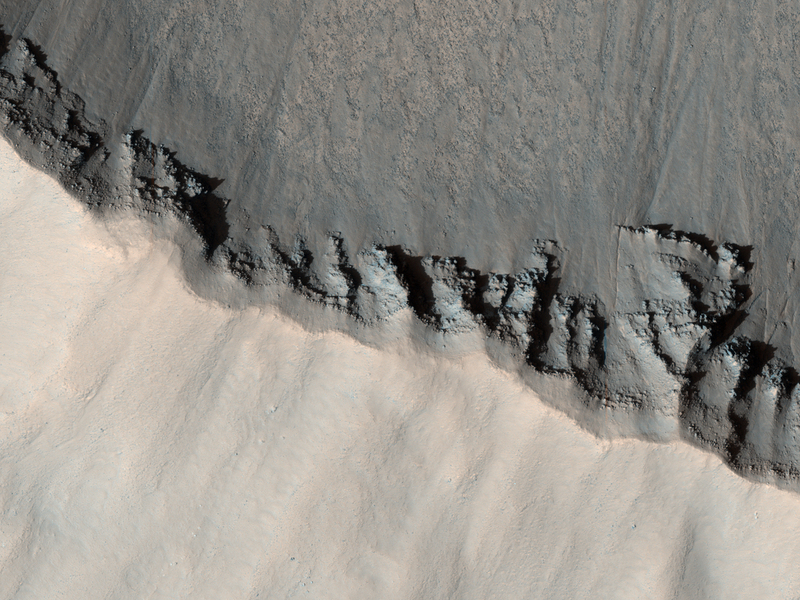 HiRISE has targeted several places where OMEGA and CRISM show extreme diversity, with this being one example. In this specific area, low-calcium pyroxene (LCP) materials are adjacent to these clays. The cracked terrain regions evident at the highest resolution provide clues to the sequence of events which occurred in Nili Fossae. This scene features a high latitude, northern hemisphere crater with double-layered ejecta. The sharp rim and lack of small superposed craters indicates that this crater is relatively young. The semi-circular feature that parallels the crater rim is a terrace that probably formed as part of the crater wall collapsed into the center. The circular mound in the center likely formed at the same time as the crater itself. 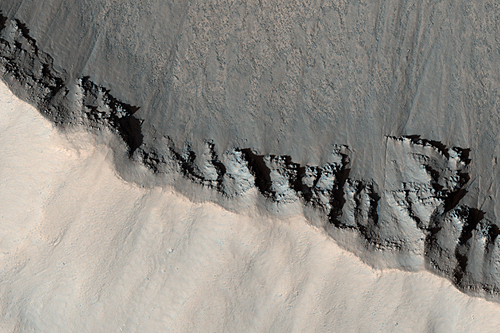 Large craters on Mars can have central peaks; this crater looks like it was on the cusp of having one. The linear features surrounding the crater on its ejecta are striations that formed during the impact as material and wind exploded out from the center. 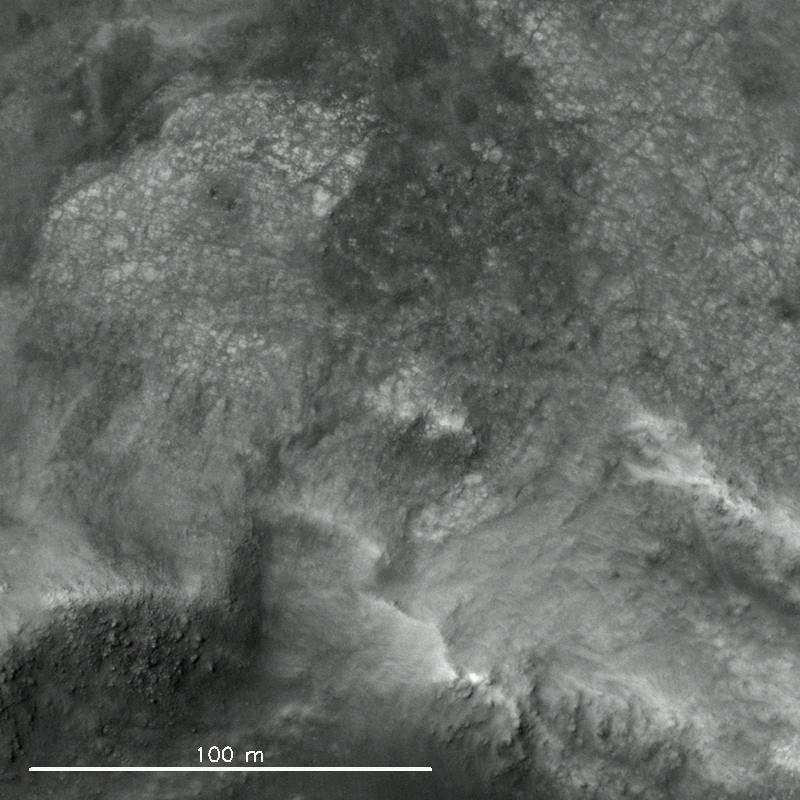 At the bottom of the scene is a very distinct ejecta flow lobe (lobate ejecta). 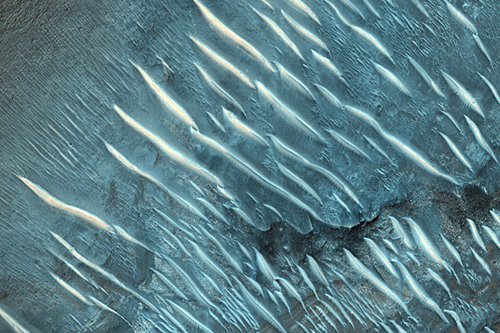 Lobate ejecta is thought to form when an impact occurs on a surface with lots of volatiles—ices that quickly turn to gas when they are heated. The gases help make the ejecta flow like a fluid. Two samples were delivered to the Wet Chemistry Laboratory, which is part of Phoenix’s Microscopy, Electrochemistry, and Conductivity Analyzer (MECA). 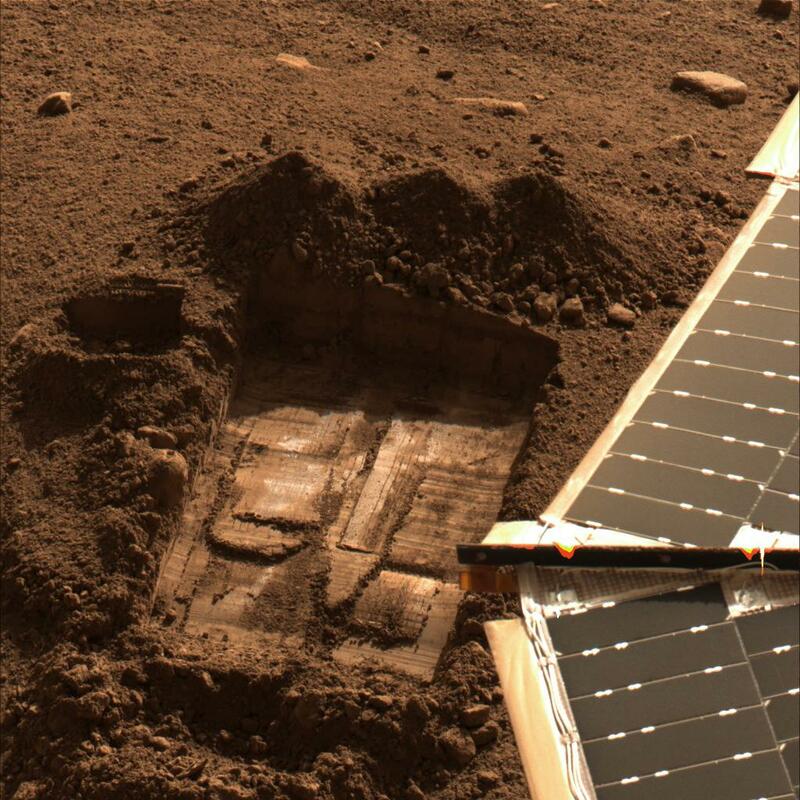 The first sample was taken from the surface area just left of the trench and informally named “Rosy Red.” It was delivered to the Wet Chemistry Laboratory on Sol 30 (June 25, 2008). The second sample, informally named “Sorceress,” was taken from the center of the “Snow White” trench and delivered to the Wet Chemistry Laboratory on Sol 41 (July 6, 2008). The Phoenix Mission is led by the University of Arizona, Tucson, on behalf of NASA. Project management of the mission is by NASA’s Jet Propulsion Laboratory, Pasadena, Calif. Spacecraft development is by Lockheed Martin Space Systems, Denver. This panorama mosaic of images was taken by the Surface Stereo Imager on board NASA’s Phoenix Mars Lander. This mosaic documents the midnight sun during several days of the mission. The foreground and sky images were taken on Sol 54, or the 54th Martian day of the mission (July 20, 2008). The solar images were taken between 10 p.m. and 2 a.m., local solar time, during the nights of sols 46 to 56. During this period of 11 sols, the sun’s path got slightly lower over the northern horizon, causing the lack of smoothness to the curve. This pan captures the polar nature of the Phoenix mission in its similarity to time lapse pictures taken above the Arctic Circle on Earth.